In 2002, restless and searching for the longest possible journey to undertake without "quitting the day job," novice hiker Jan Leitschuh laced up some new trail shoes, hefted an unfamiliar backpack and set foot on Vermont's rugged 270-mile Long Trail. Along with her opinionated, heart-attack challenged hiking partner Clyde, the pair tested the outer limits of their physical endurance, friendship and good humor - walking from Massachussetts to Canada in the process. Winner of the 12th Annual Independent Publisher Bronze Book Awards! 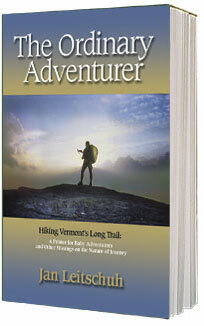 Based on journals posted online in near-real time, The Ordinary Adventurer is a true account of their 2002 End-to-End hike of Vermont's 270-mile Long Trail. This is a book for anyone who has longed to set out on a journey of adventure and freedom.